The UK Travel Scarf | Knit Like You Mean It. Like this scarf, our trip had its ups and downs. Mr. Trask and I had a nifty plan. We thought we’d save a little money. If you buy a round-trip ticket on the British rail system, it often costs just a couple of pounds more than the single ticket. For example, a single ticket from Oxford to London is #19.90. A round-trip one is #20. Amazing, right? So as we went from point A to point B to point C…we bought the round-trip open return tickets. That means you have a month from the date you started to use your return ticket. Easy as pie. Now, if you do as we did and leave one day when you will retrace your steps alllll the way back to your starting point…well, you’re going to have a long day, with lots of connections to make. The Road from Pitlochry...or the tracks, anyway. I was not very enthusiastic about this trip, I will admit. But then Mr. Trask said, “You can knit on the train,” (looking meaningfully at the horde of yarn I had acquired since our arrival in Scotland). And I realized, as I do from time to time, that my spouse is a brilliant man. What better time than a 9.5-hour train ride to start and finish a scarf? It would keep me busy, and I had some lovely new yarn from McAree Brothers in Stirling: Sirdar Sublime DK organic merino (rav lnk), soft and buttery, in lovely colors. I’d make stripes in the scarf. Heck, I’d knit the scarf side-to-side instead of up-and-down! Mr. Trask agreed to photograph me at each connection, showing the progress I’d made on the scarf. And a brilliant, slightly batty idea was born. So the real point of this post is: was I able to finish a vertical-striped scarf made of wool I bought in Stirling, Scotland, while catching various connections to sundry trains? The answer…below. Pitlochry: the sticks and the string have yet to meet. See how cheery I look? Leg One: Pitlochry, Scotland to Stirling, Scotland. One hour, 11 minutes. The day started out well, despite my having slacked off on knitting a gauge swatch the night before. I cast on 30 stitches and knit 36 rows – a nice big swatch is always better. 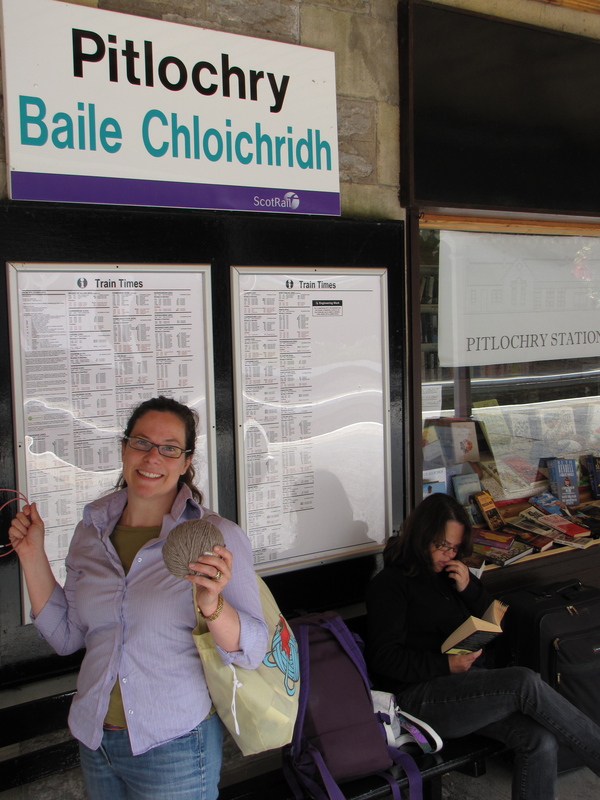 The train stations in Scotland are really picturesque; it was a pleasure to sit there and knit, waiting for our train. The station had what was called a charity bookstop but was really a table full of used books set up outside on the platform. Since I’d just stuffed about fifty square miles of yarn into my luggage, I decided I didn’t need anything else to carry. Since it was Saturday morning, the train had a holiday feel to it: everyone was on their way somewhere fun, or at least acting that way — except for the conductor, who as we pulled out of the station announced that we were leaving 4 minutes late because “someone had their foot in the door.” I swear it wasn’t me. My gauge swatch gave me 4 stitches and 9 rows to the inch. I did some quick math and, between Perth and Gleneagles, started to cast on 240 stitches using the long tail method. I had gotten to 170 when I ran out of long tail. Gnashed teeth, considered making scarf much shorter (and, hey, much quicker to finish! ), ripped out and cast on again. This time, had very long tail left over but cut off the extra and hid it at the bottom of my bag. 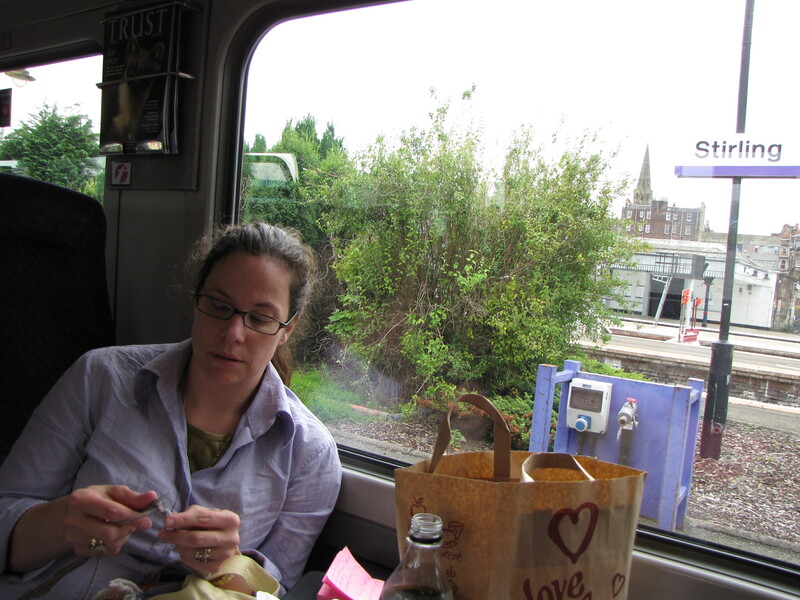 Arriving at Stirling, we bought cold drinks and reminisced about UK Knit Camp, and I knit row one of the scarf. Stirling: Knitting helps me make friends. Leg Two: Stirling, Scotland to Edinburgh Waverley. Fifty-five minutes. This was the leg, we knew, that would separate the men from the boys. Edinburgh is chock-full of tourists in August because of the Fringe Festival, a glorious affair that offers show upon experimental show for the intrepid theatre-goer. That was why we’d stayed in Carlisle: we could stay there more reasonably and sanely, but pop up to the festival each day as well. Our time in Edinburgh had taught us that the train station would be a zoo, but we were feeling all right until the nice couple sitting next to us told us that, not only was the festival still raging, but that the Edinburgh Tattoo and the first football match of the season were also happening that day. Of course they were. 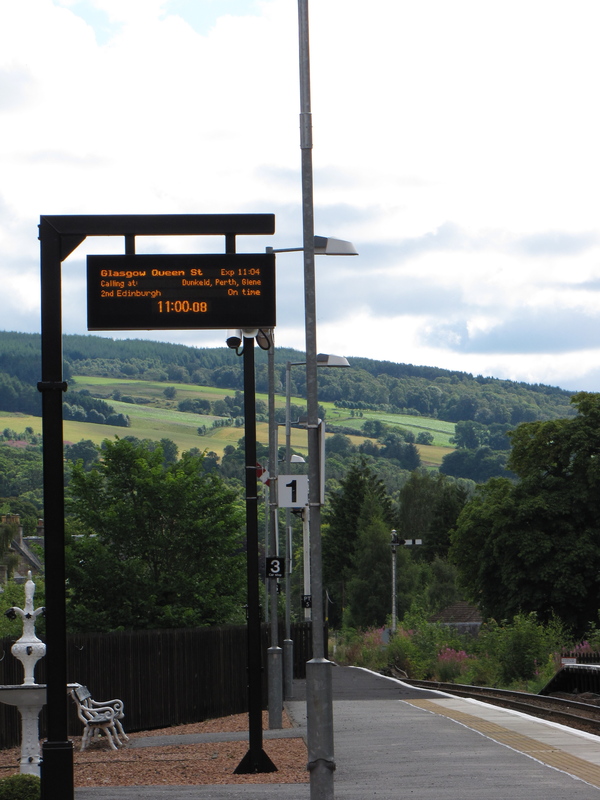 The feel of this leg of the journey was ever so slightly more competitive, and after two stops people were standing in the aisles and even in the area between the cars to get to Edinburgh. Still, most of us were more excited than upset about the crowd and its reasons for being there (but I may only say that because I got a seat). Bright spot: as I settled into my seat and started row two of the scarf, a lovely Scotswoman asked whether I’d been up at Knit Camp; of course, she had too. We compared notes: she’d taken dye classes and brought her husband up to the spinning night on Friday, and he was thinking of buying a spinning wheel himself! I asked Mr. Trask whether he’d like to learn to spin; he declined. My new friend and I agreed, though, that any husband who was willing to come to Stirling for a few days so his wife could go to Knit Camp was a good husband indeed. As the train started, our conductor announced that we were leaving one minute later than the schedule had indicated (no reason given). At the next stop, the couple with the Edinburgh-Tattoo-and-Football-Game information got on, and the wife asked what I was knitting. I explained that I was making a scarf, and knitting it side-to-side rather than end-to-end. “She gets these ideas,” said Mr. Trask. The husband looked sympathetic. The wife revealed that she starts more projects than she finishes, and I said that I do, too. “You must be going the long way round,” said the husband. We allowed that, indeed, we were. At Edinburgh, I started the stripes. 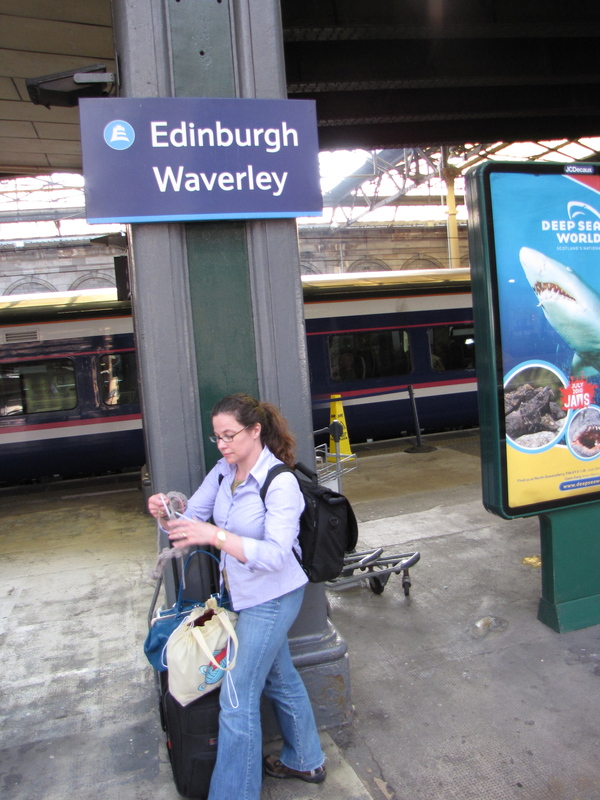 Leg Three: Edinburgh Waverley to Carlisle, England. One hour, 20 minutes. At Edinburgh, we had a brief delay and I finished the first eight rows (in a nice oatmeal brown color) and changed to the next stripe (in a lovely cream). I got the merest hint of aggressive about keeping our place in line for the train to Carlisle and as a result we did get seats. On the way to Lockerbie, I switched to the third stripe, a nice aqua blue. At Lockerbie, a group of teenagers in fancy dress got onto the train (costumes: glittery soldier; pimp; tarty maid; naughty policewoman; and “I’ve got to put on my costume when we get to Carlisle.”) and I discovered an impossible snarl in the nice aqua blue. I should never use the center pull end. It never works out for me. The costumed girls laughed heartily, but I am about 85 percent sure they weren’t laughing at me. By Carlisle, halfway through our journey but NOT halfway through the scarf, I was beginning to feel very gloomy. The scarf wasn’t done, the trip was definitely not done, and I didn’t have a costume on. Lunch helped some, and so did admitting to Mr. Trask that I was not sure where our passports were, and had been wondering about their whereabouts since Edinburgh, when it first occurred to me that I hadn’t seen them for several days. Mr. Trask reminded me that I had given them to him at Stirling, and all was right with the world. I changed stripe colors again. By Carlisle, the scarf was not as long as I would have liked. But at least we didn't have to stay at that hotel again. Leg Four: Carlisle to Wolverhampton. Two hours, 22 minutes. I didn’t have a chance to tell you all about our time in Carlisle, so I’ll give you a brief rundown: we found a lovely Greek restaurant, a fantastic gluten-free cafe, a very nice art museum, an impressive castle, and the absolute worst hotel either of us had ever stayed in. I am not exaggerating here; the first evening was traumatic in the truest sense of the word. We spent our dinner at the Greek restaurant listing out all the bad hotels we could think of, and comparing them to this one. It was, hands down, the worst. Before you ask, our survey included both Fawlty Towers and that Yours Is A Very Bad Hotel place. 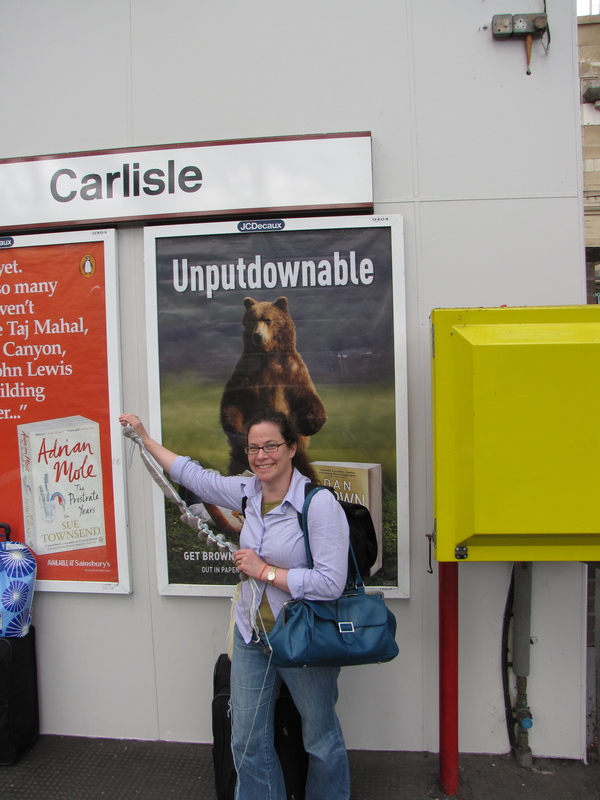 So our brief stop in Carlisle was still too long, and we were glad to get along to Wolverhampton. It was during this leg of the journey that I remembered my first trip around Scotland, with my mother, between my first and second years in college. We rented a car and drove all over, alternately bonding and arguing, the way mothers and daughters do. The car was a standard shift, and of course everything was reversed on it (since one drives on the opposite side of the road, one also shifts with the left hand rather than the right; also, the windshield wipers are where you’d expect the turn signals to be). Mom drove the entire time, because I was 19 and she didn’t yet trust me as a driver. I found the road part of our road trip to be a highly anxious experience; she wanted to center herself, rather than the car, in the road, which meant that my passenger side was often in the bushes by the side of the road. Every time we got to a rotary, she’d start around it, make a nervous squeal, try to put on her turn signal to indicate she was leaving the rotary, realize she’d turned on the wipers instead, swear, and then run my side of the car back into the bushes as we got onto the straightaway. She was a wonder, my mother. On the train to Wolverhampton, knitting and I had A Little Moment. What I’d forgotten was that I was knitting the entire time. I’d bought some Manos del Uruguay wool (rav lnk) before we left to make my boyfriend-of-the-time a scarf, and I just knit stripe after stripe of garter stitch. By the end, it looked very like a Doctor Who scarf (though when someone said that to me I didn’t know what they were talking about). I loved everything about this scarf. I loved the feel of the yarn. I loved the colors. I even loved the way the backs of the previous row’s stitches popped out on the wrong side when I changed colors. I thought that part was super-cool. And the knitting kept me from screeching at my mother, teenager-style, every time she nearly killed us on the road. So, on the road to Wolverhampton, I remembered my mother a bit, and I remembered what it was like to be a fairly new knitter and find absolutely everything about the craft beautiful. I had a little moment with knitting, there in the train headed south, and felt grateful again that I have a skill that can keep me sane when I have to do something uncomfortable, and sometimes even keeps the people I love warm (I’m not going to tell you about how the boyfriend would never wear the scarf. It would depress you. In his defense, it was a really, really long scarf). Leg Five: Wolverhampton to Oxford. One hour, 33 minutes. At Wolverhampton, our time to make our connection was about 10 minutes, and was complicated considerably by a sudden platform change. We made the train without a minute to spare…hence no update photo from the Wolverhampton platform. By this point in the day (about 7:30 p.m.), the train was full of people on their way out on a Saturday night…and a whole gaggle of cheerful men on their way home from a football match. The football hooligans (who were, in fact, very well-behaved, considering) kept announcing to each other that they’d been drinking all day. Weren’t they together all day? Outside Birmingham Airport, the conductor ran back over the stops our trains would be making: including “Basingstoke — don’t know why anyone ever stops in Basingstoke, but never mind.” I reached the midpoint of the scarf, wondered whether the stripes clashed, recognized that I was way too far in to make a change, and sent up a prayer to the knitting gods: Please Don’t Let the Stripes Clash. We spent the night in Oxford, so I will conclude this report tomorrow, for maximum suspense. Will we get to London? Will I finish the scarf? Will we ever recover from almost 10 hours of sitting backwards on the train? 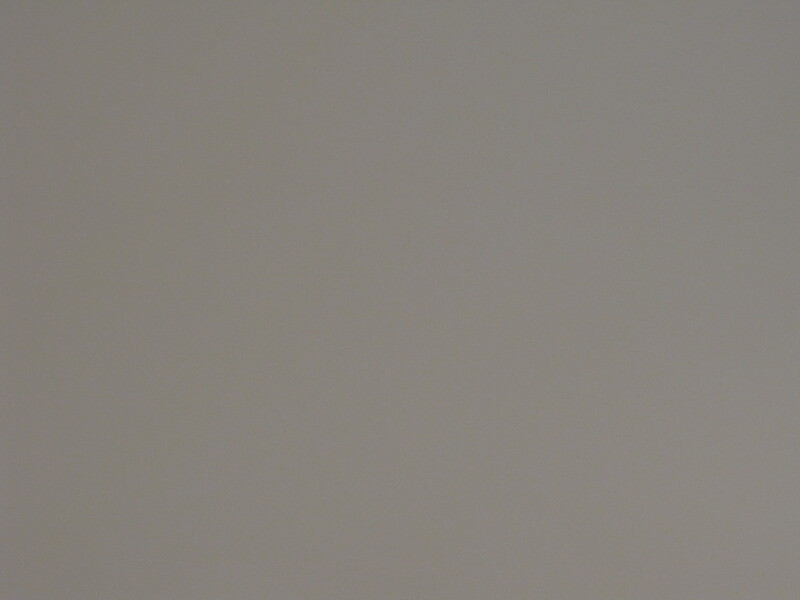 The answers to all these questions and more…tomorrow. This is brilliant. I await the next post with breath that is bated. Hey, thanks! Don’t, you know, HOLD your breath, though. That would be dangerous. you are hilarious and the scarf looks cool. So, what happened to the boyfriend after you knit the scarf? ‘Cause you know the myth about knitting for the guy before you get the ring, or maybe that just applies to sweaters. 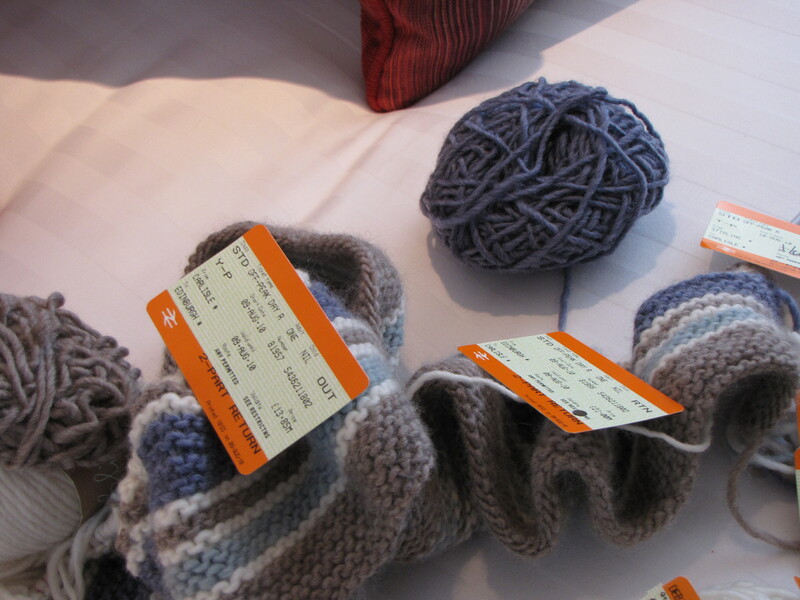 How cool to knit on a train in the UK. That could be a fantasy for me…. Love the scarf, BTW.